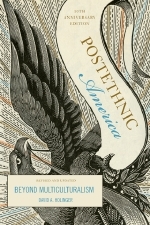 First published in 1995, Postethnic America was widely hailed as a groundbreaking proposal for healing our nation’s ethnic divisions. David A. Hollinger, one of America’s foremost intellectual historians, argues for replacing the pluralist model of multiculturalism that is based on the idea of group rights with a cosmopolitan model that recognizes the reality of shifting group boundaries and multiple identities. Postethnic America is a bracing reminder of America’s universalist promise, and a stirring call for a new form of nationalism.